How Are Dental Crowns Made? Ask A Dentist in West Monroe! Have you recently found out that one of your teeth needs a dental crown? There are a lot of reasons people might need this type of restoration, whether it’s a cavity, fractured tooth, or an injury. In fact, with millions of crowns done in the U.S. each year, it’s one of the most common dental procedures we do! As a dentist in West Monroe, we’re often asked why crowns are necessary and how they’re made, so we’re writing a blog to answer those questions for our readers. Remember, regardless of why your tooth is in trouble, you’ll be glad to have it back to (almost) new after getting your crown! If you have a cavity, fracture or chip, and it’s small enough, it can usually be restored with a simple filling. However, if the damage to your tooth is more extensive, there might not be enough remaining tooth structure to “hang on” to a filling. In this case, a dental crown is necessary to restore a tooth’s shape, function and appearance. Once the crown is done, the tooth will look and feel completely natural. 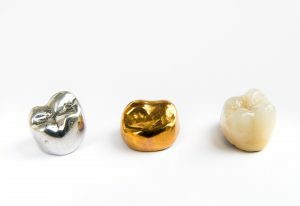 Crowns are strong, long-lasting restorations and can be made of different materials like gold, porcelain and zirconia. A dentist will recommend the best material based on the location of the tooth and other factors, including your cosmetic goals. How Will Your Crown Be Made? Your dentist will get your tooth numb and remove any damaged tooth structure to “prep” it for the crown. The tooth will be made slightly smaller so it can accommodate the crown. Molds will be taken and sent to a dental lab where they’ll be used to custom-make a crown. It will be precisely matched in shape and color so that it blends seamlessly with your smile. You’ll have a temporary crown while you’re waiting for the permanent one to be made so that you can chew, smile and function normally until your second appointment. The temporary crown will be removed and the permanent one will be cemented into place. As the final step, your dentist will make sure the crown looks and feels great and will make minor adjustments as necessary. With a strong, durable restoration like a dental crown, you can enjoy a healthy smile for many years to come! As an award-winning general, restorative and cosmetic dentist, Dr. L. King Scott has been using dental crowns to restore the smiles of his patients for many years. He loves being able to repair someone’s damaged tooth and give them many more years of enjoyment out of their smile. If you have any questions, he can be reached via his website or at (318) 325-4600.